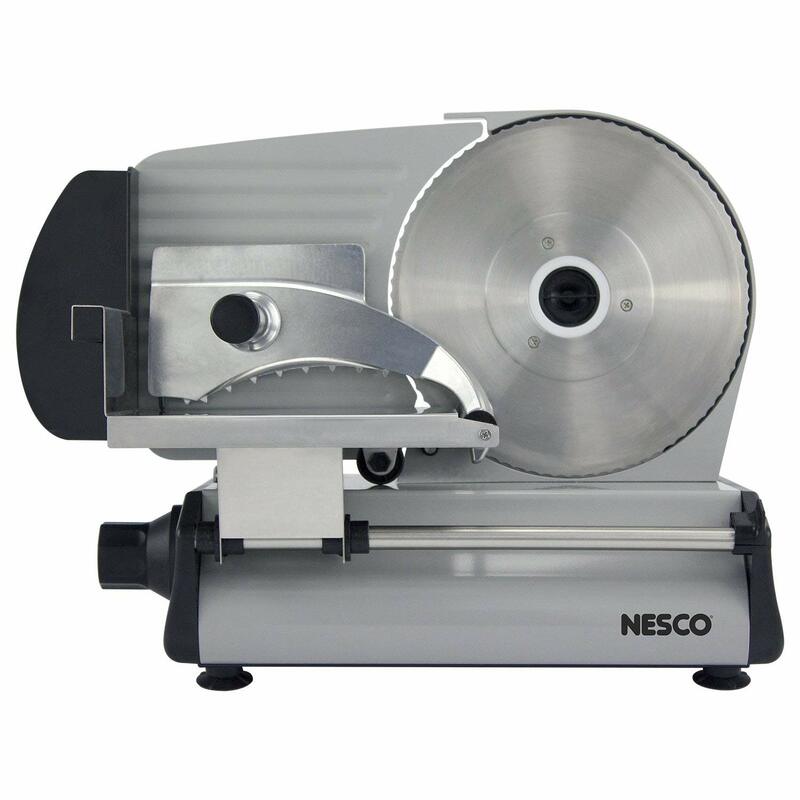 We looked at the top 1 Meat Slicers and dug through the reviews from 9 of the most popular review sites including BestReviews, Village Bakery, The Z8, My Kitchen Advisor, Do Best Products, Tasty Kitchenn, Cut Sliced Diced, Furious Grill and more. Through this analysis, we've determined the best Meat Slicer you should buy. Precision is a high point with the Chef's Choice 609, which boasts an easy-to-control thickness adjustment. Thanks to its electric operation, there's little effort to the job, and it runs quietly throughout. Afterward, easily removable parts make for quick cleaning. In our analysis of 88 expert reviews, the Chef'sChoice Chef'sChoice Electric Food Slicer placed 1st when we looked at the top 9 products in the category. For the full ranking, see below. Professional-grade performance at a home-appliance price point. Stainless steel and die-cast aluminum. Easy to take apart and clean. The primary feature that we really enjoyed with this food slicer was how easy it was to clean it down. It takes literally seconds to pull it apart and wipe it down so you can transition between foods easily and without contamination. 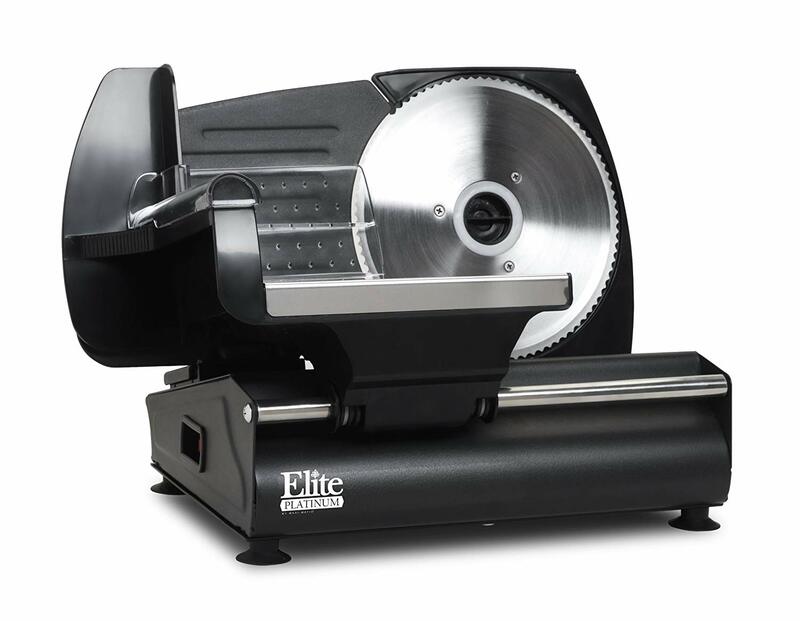 The best part of this slicer is that it is electric and hence doesn’t require any manual input in it. Talking about sturdiness or flexibility, this one has it all. Runs quietly. The engine on this machine is quiet given its power. It’s great for use in a home or apartment where you want to prepare food without alerting everyone in the building. Whether you want to cut large pieces or small ones, the slicer boast adjustable precision cut control for thin deli cutting. Its precision is high thanks to the precision thickness control. Therefore, you can have from deli-thin slices to one-inch thick slices of meat. The tilted big food carriage will make for the most effective and time efficient slicing experience – and you can actually slice quite a chunk at a single go. The good thing is that it can still chop different sizes of meats ranging from 3/4-inch steak to deli-thin meat. Besides this, it can also slice other food types such as bread, veggies, brisket, cheese etc..
7" blade is smaller than some other slicers (but still incredibly effective). The one design flaw in this Chef’s Choice meat slicer is that the feed tray has a gap between it and the blade. If you’re cutting softer items, this tends to feed food products into the gap and have them rotate around the blade. The blade is a little on the smaller side. 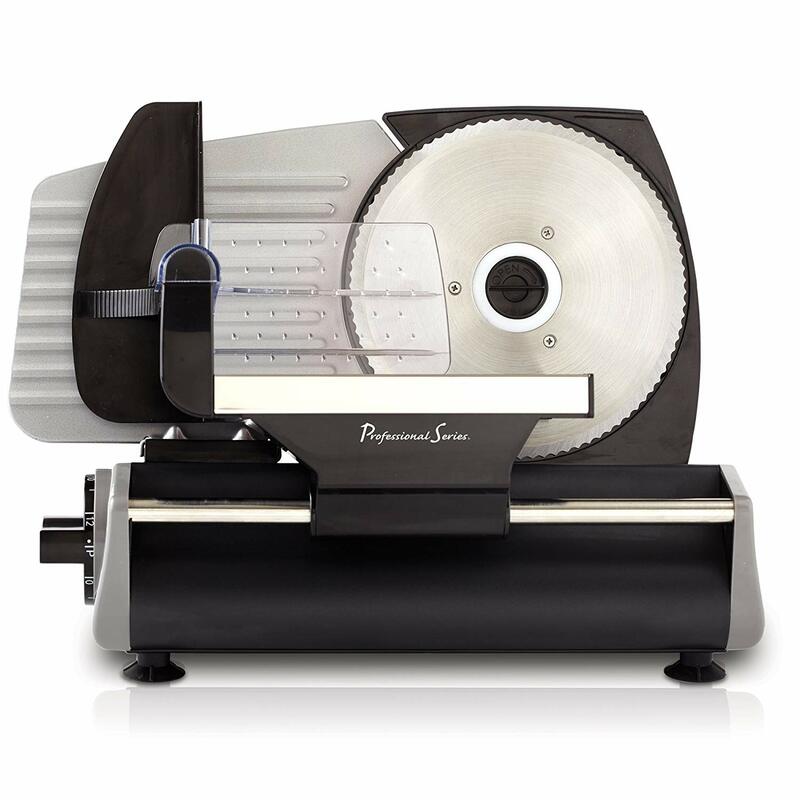 The seven-inch blade will suit people cooking for smaller families, but if you want to slice large items or use this slicer in a business setting, then you’re likely to find the blade to be too small. Removing all the parts of the slicer when cleaning and putting them back isn’t as easy. However, the 7-inch serrated blade is relatively smaller than what is found in other top models. 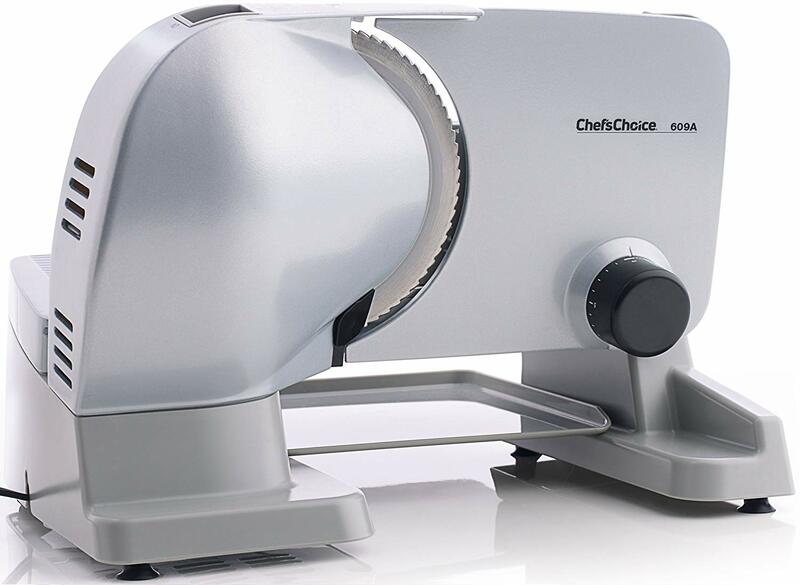 Chef'schoice electric food slicer 609T 609 is rugged and powerful. 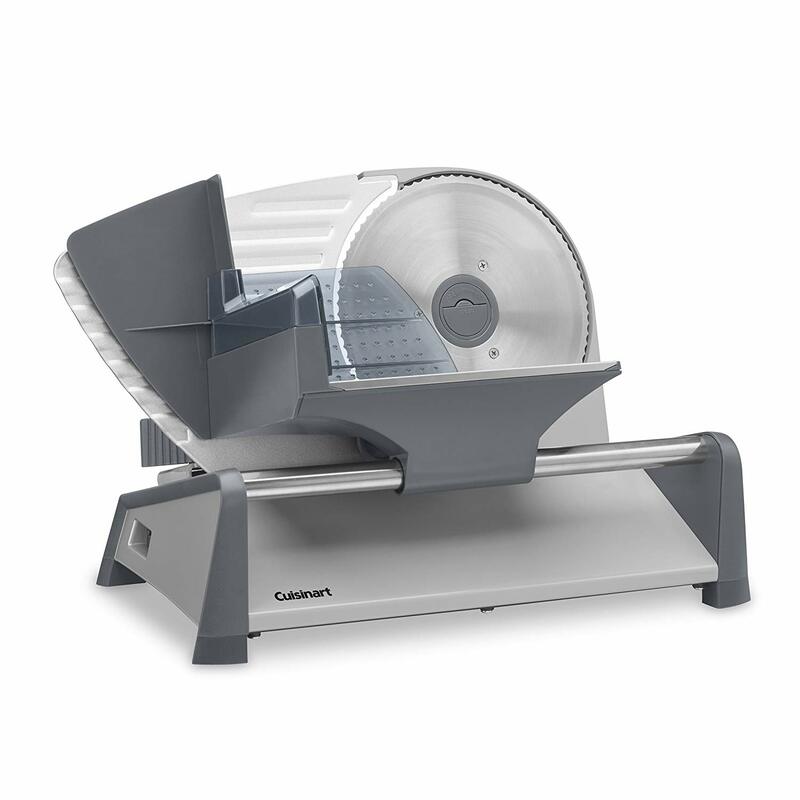 It features a tilted food carriage design for fast and efficient slicing. 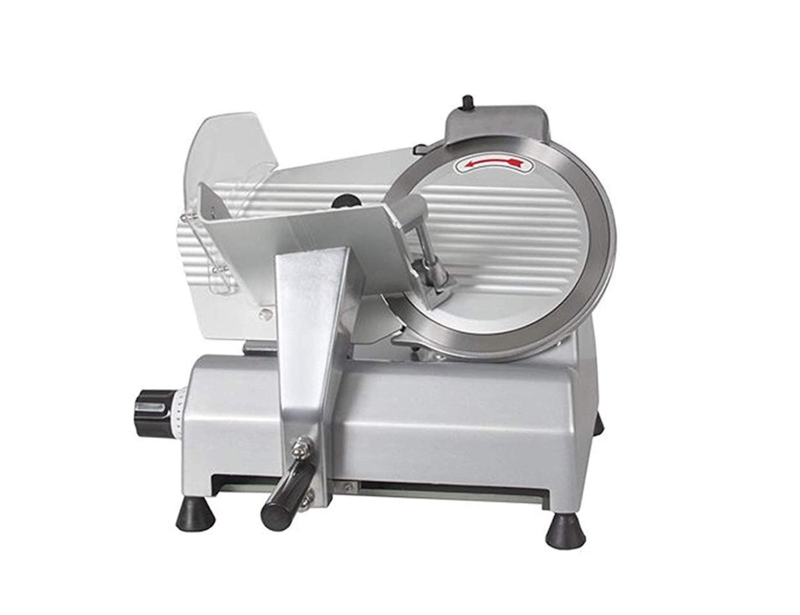 The multi-purpose 7-inch stainless steel blade slices a wide variety of foods and the large Capacity food carriage retracts fully to permit slicing of extra large roasts, hams and other foods. Its "easy-clean" design features a removable blade, food carriage, food pusher and food deflector for quick and easy cleaning. Constructed with key components made of cast aluminum and stainless steel, the unit houses a powerful, cool running, high torque motor and features reliable, smooth, gear drive operation. It features precision thickness control for slicing a wide variety of foods including meat, vegetables, breads and cheese from deli-thin to 3/4-inch thick with a click of a safety button the food carriage can be secured in a "lock" position to limit access to blade when unit is not in use. Serving tray included.